AMAZON IS BUILDING UP ITS MEDICAL SUPPLIES BUSINESS:Amazon is expanding its business-to-business marketplace Amazon Business to better serve US hospitals and outpatient clinics with medical supplies,according to the Wall Street Journal. The e-commerce giant has reached out to hospital executives to discuss turning its marketplace from a business with a limited selection of medical supplies to a major supplier of products, including more specialised items like hip implants. Amazon’s presence in the medical supply business could drive down costs and drive out some competitors. Hospital purchasing is typically structured around contracts between hospital systems, distributors, and manufacturers. These transactions often come with additional costs, which can significantly increase the price of supplies – fees and administration, marketing, and shipping costs account for 20% to 30% of healthcare supply costs, according to an estimate by Citigroup Global Markets Inc. Providing hospital systems with direct access to multiple manufacturers and an easy way to compare their prices will lead to more competitive pricing on medical supplies. This will not only reduce the direct cost of supplies, but will also cut out other fees, such as those paid to middlemen who facilitate medical supply transactions. How will this impact the healthcare industry? Amazon appears to be building out a full healthcare ecosystem, which would make it the biggest digital threat to the $US3 trillion US healthcare industry. In the past year alone, the firm has introduced HIPAA-compliant cloud features,entered into a cloud partnership with health tech giant Cerna, launched a challenge to third-party companies to develop Alexa skills to help people with diabetes manage their condition, and in January it announced the creation of a healthcare company with JPMorgan Chase and Berkshire Hathaway. If Amazon continues on this trajectory it will become a one-stop shop for providers and patients. FITBIT ACQUISITION EXPANDS ITS DIGITAL HEALTH FOOTPRINT: Fitbit is acquiring cloud-based healthcare platform Twine Health, to make its line of wearables more valuable to consumers and healthcare providers, alike. Twine’s HIPAA-compliant platform connects consumers diagnosed with chronic illnesses, like diabetes and hypertension, with doctors and coaches. The healthcare professionals can develop lifestyle strategies and programs to help patients monitor and manage their illnesses. 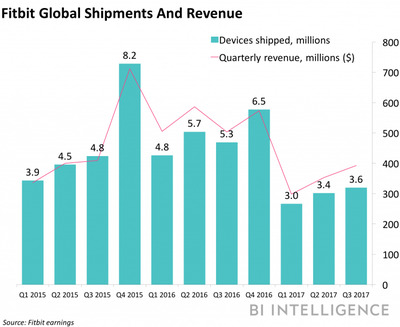 The acquisition, which is expected to close in Q1 2018, is just the latest effort by Fitbit to build momentum in the healthcare industry, as it looks to generate more revenue from subscriptions and services to supplement its flailing hardware business – in the first nine months of 2017, total device shipments fell 37% year-over-year. For now, Fitbit will focus on rolling out Twine’s platform to its consumers, which will provide them with more context around their fitness tracker data. But the purchase could also lay the groundwork for future collaborations between Fitbit and healthcare networks that want to use Twine’s health data software to support and measure the valuable health metrics collected from Fitbit’s trackers. The fitness tracker company isn’t alone in its move into healthcare: Apple has also made some aggressive moves recently with its Apple Watch and Health app as it strives to carve out its share of the healthcare market. NANOROBOTS SHOWN TO REDUCE AND KILL CANCEROUS tumours: Scientists have developed a method to kill cancerous tumours and stop future growth by using microscopic robots, according to a newly published study in Nature Biotechnology. Scientists injected tumour-bearing mice with DNA nanorobots, which essentially function as intelligent drug delivery systems. Once injected, these nanorobots sought out cancerous tumours and injected them with thrombin, which caused blood clots in the tumour’s vessels cutting off its blood supply, according to TechCrunch. Mice injected with the nanorobots were shown to have smaller tumours and a better chance of survival compared to the control group mice that didn’t receive the nanobot injection. The technology still has a long way to go to prove an effective tool in treating humans, however, the study shows the potential of using precise drug delivery to treat specific conditions. THREE QUARTERS OF MOBILE HEALTH APPS POSE SIGNIFICANT RISK TO CONSUMER DATA: 72% of mobile health (mHealth) apps in Europe, which process large amounts of sensitive consumer data, fail to provide even the most basic protection to users’ privacy, according to a study by the Institute of Electrical and Electronic Engineers (IEEE). The study tested the top 20 most downloaded apps in Europe’s Google Play Store. The apps had to be free, have been downloaded from Europe’s Google Play Store at least 100,000 times, and require users to input health or personal data that gets transmitted to an off-device server. Researchers found that none of the apps tested were without any risk to users’ privacy and 72% of the apps tested imply a high-to-medium-high risk to users’ privacy. Health data breaches have become an increasingly common occurrence in the healthcare industry. The sensitive nature of patient data collected by healthcare providers, which could include names, addresses, social security numbers, payment information, and health records, has made it an appealing target for cybercriminals. In the US, for example, 83% of US physicians have reportedly experienced some form of a cybersecurity attack, according to Accenture and the American Medical Association (AMA).